This unplanned ‘experiment’ is akin to a controlled tracer exercise in geomorphology, whereby a collection of coloured pebbles are placed on a beach or in a river bed, and attempts are made to recover the pebbles at various intervals thereafter to see how far they have moved during tidal, wave or flood events. From this information, geomorphologists can learn much about the processes, patterns and rates of sediment movement in flowing water. Given that we can send manned missions to the Moon, control rovers on Mars, and even land instruments on comets more than 6 billion kilometres away (http://www.bbc.co.uk/news/science-environment-30069244), you would think that we would know most of what we need to about these fundamental processes. Not so. The mechanics of sediment movement in flowing water is exceptionally complex – just think of those countless billions of sediment particles of all shapes and sizes jostling and being jostled within highly turbulent waters – and still defeats the attempts by some of the best brains to model or predict the phenomenon with any great degree of accuracy. So even basic field experiments – planned or unplanned – still provide useful information. As the BBC articles outline, in the case of the Lego, oceanographers and coastal geomorphologists will be able to learn much about the vagaries of oceans currents and tides, adding to our knowledge about the poorly-known watery 70% of our planet. 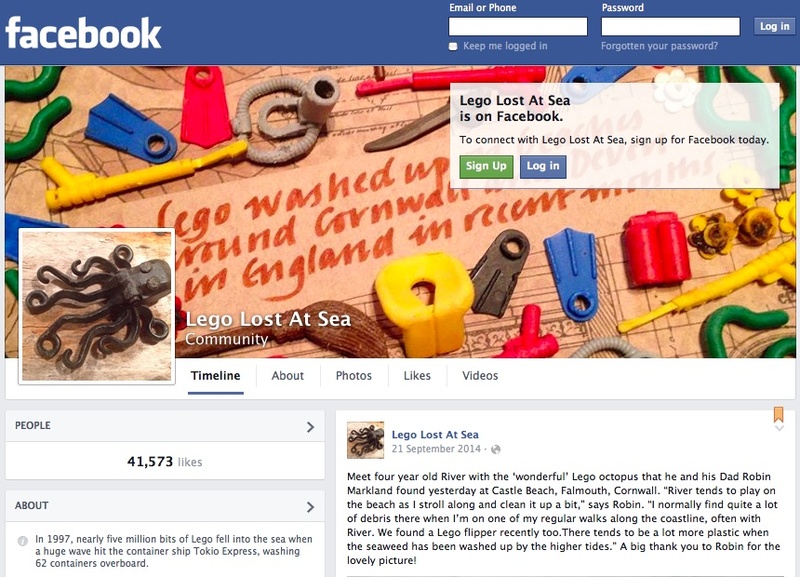 Although a uniquely quirky case study, the Lego story is also illustrative of the larger debate about plastic pollution in the world’s oceans. Large areas of the oceans have become known as ‘garbage patches’, the most infamous being the huge Pacific Garbage Patch, located half way between Hawaii and California (http://www.bbc.co.uk/news/magazine-29631332). Were Samuel Taylor Coleridge’s ancient mariner and crew to be becalmed in this part of this ocean today, rather than complaining about a lack of drinking water, they may well have had reason to comment on all the shredded plastic bags, torn crisp packets, broken tupperware, bits of polysterene and numerous other plastic items swirling in the water column. Regardless of whether ‘plastic soup’ is a better term than ‘garbage patch’, the problem is the same: large quantities of industrial (‘man-made’) materials are entering natural systems. Plastics, ceramics, glass, metals, bricks … the list of manufactured items goes on and on. Ocean plastic pollution thus is illustrative of a wider debate still: namely the extent of the legacy that our industrial age will leave behind for future generations. Some of these industrial materials will degrade over time, simply returning the compounds and elements to the Earth. Others will be buried more or less intact in sediments on the ocean floor or along beaches. Others will transform, perhaps fusing with natural materials to form new types of rock (e.g. so-called ‘plastiglomerate’ on Hawaiian beaches – http://news.sciencemag.org/earth/2014/06/rocks-made-plastic-found-hawaiian-beach). Others still will break down to smaller and smaller pieces but perhaps always remain in some form or other. Physical breakdown of large plastic items to smaller and smaller pieces (collectively termed ‘microplastics’) is a particularly insidious problem, given the largely unknown implications for pollution of food chains. Marine animals accidentally ingest some of the microplastics, which can fill the stomach and lead to death by starvation, and there is also the potential to affect higher trophic levels. 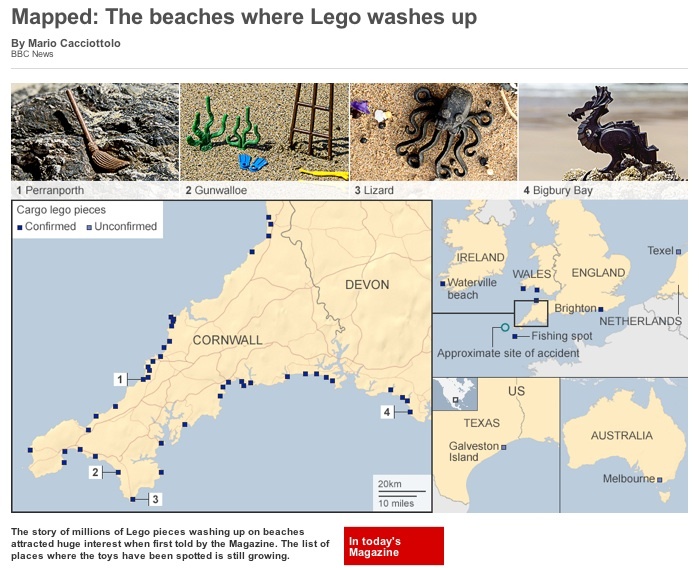 18 years after they were washed overboard and released to the ocean, some of the Lego pieces are washing up on beaches in Cornwall and farther afield in good condition. But given 180 years, 1800 years, 18000 years or longer, into how many bits will these nearly 5 million Lego pieces fragment?